Rayon/polyester. Cord trim. Zip closure. Dry clean. Made in the USA of imported fabrics. EXCLUSIVELY AT NEIMAN MARCUS Sham with metallic brush fringe. Front, rayon chenille/polyester/rayon. Back, cotton/polyester. Hidden zip closure. 19" x 35". EXCLUSIVELY AT NEIMAN MARCUS Sham with metallic brush fringe. Front, rayon chenille/polyester/rayon. Back, cotton/polyester. Hidden zip closure. 19" x 35". Dry clean. Made in the USA of imported materials. Sham finished with cording and tassel trim. Dry clean. Made in the USA of domestic and imported rayon and polyester. 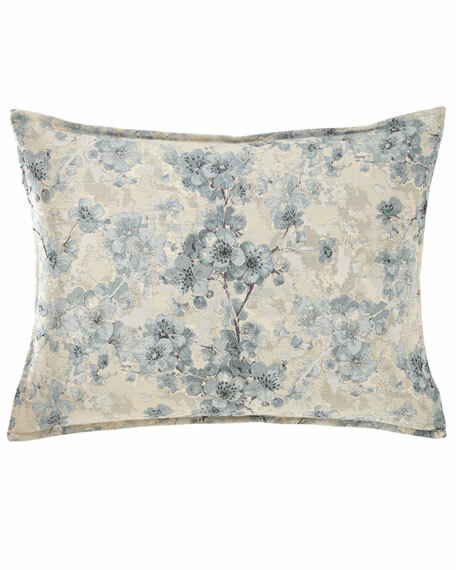 EXCLUSIVELY AT NEIMAN MARCUS Pieced sham with damask center and ruched linen. Front, polyester/rayon chenille/linen; back, polyester. Aqua onion trim finish. Hidden zip closure. 19" x 35". Dry clean. Made in the USA of imported materials.